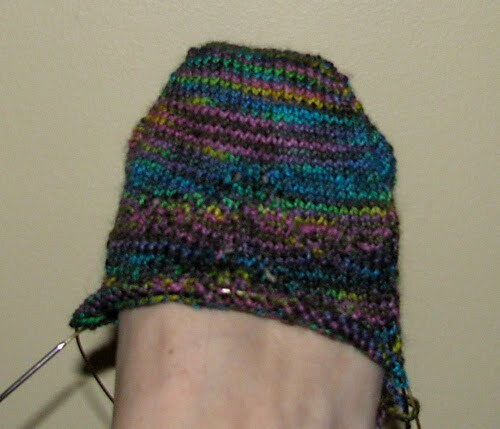 “On-hold Socks” – the pattern is by Wendy D. Johnson and it’s from a book called “Socks from the Toe Up. I figured I’d make them two-at-a-time, and I thought I’d only wind up spending a few short evenings on them. Except that it knits up a wee bit larger than the pattern calls for. This means that I had to back up and adjust the pattern. I backed up to the toe increases and did not add on the last set of 4 increases. It still seemed loose but I still thought they would be fairly wear-able. Last night I spent the evening making the heels. I wasn’t sure how the pattern would knit up, so it was interesting to see the construction. I’d modified things to take into account my slightly smaller pattern. They looked all right, but by the time I finished and tried it on, I realized that I have rather narrow heels and I didn’t like the extra bulk and width that was there. This means that I will have to back out and put in a couple of decreases on each side before I re-do the heels. If I don’t fix them, I will never wear them.